<p align="center">Came across this and thought that it was not a good design. the Bathtub directly over the panelboard. What were they thinking? This could be quite a show if the need arises to clean out that trap. This is an 'Oldie' ! This was exposed during a Kitchen renovation. The picture was taken standing in the Kitchen. I have red-tagged jobs for additions that create bathrooms with panelboards in them. I would make them move the panel. 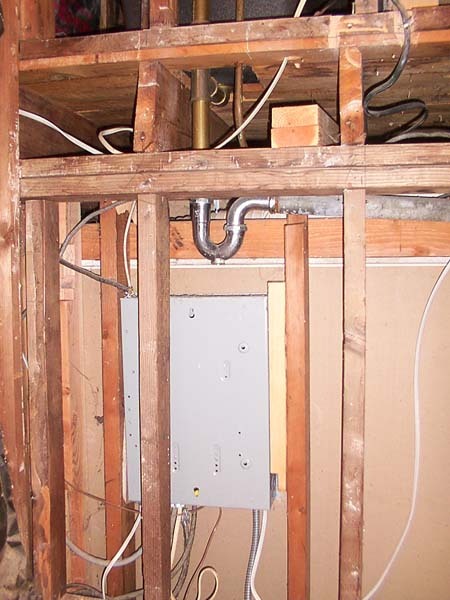 The panel definitely doesn't belong there, but is an excellent argument for using PVC drain pipe in locations where looks are not a factor.